Clarice Bruno, was born in Chicago, Illinois into a devout Italian Catholic family. She attended Catholic schools throughout her youth and graduated from the fine Catholic institution, Rosemont College, in Villanova, Pennsylvania. Clarice, for the most part, took her Catholic faith for granted. She doubted many of the teachings of the Church. There was an indifference, an apathy in her heart regarding matters of religion. Although she attended Mass on Sundays, she did not consider herself to be a good Catholic. Clarice made preparations for a trip to Chiavari, Italy in order to visit her friends and relatives. It was supposed to be a brief visit but it stretched out to be much longer. She enjoyed her trip to Chiavari so much that she decided to move there permanently. After moving to Chiavari, Clarice felt a new lease on life. She enjoyed being reunited with her relatives and was happy to be making new friends. One night she had a vivid dream. In her dream, she was on her way to the church of Our Lady of Grace in Chiavari when the road suddenly became covered with large rocks. She tried to climb over them, but it proved to be impossible. Suddenly a large hand came from behind the rocks and helped her. At once, she found herself standing in front of the church. The large obstacle had been surmounted. In front of the church, Clarice saw a Calvary composed of three wooden crosses. She was never able to lift her eyes from the base of the crosses because of the scene just beyond on the horizon. There, she saw a sea that was shimmering with an unearthly beauty. Sunlight danced upon the water and sparkled like diamonds. Clarice could not take her eyes from the beatific scene. Her heart felt an intense joy. When she woke up, she pondered the meaning of the dream. The beauty of the dream was beyond anything in her experience. She wondered if it could be a sign of something important that was soon to come into her life. She did not know. At that time, Clarice was struggling with a heavy cross, a sorrow in her life. Her cross was waiting for her when she awoke in the morning and stayed with her until she fell asleep at night. She became very discouraged. Finally, she confided some of her anguish to a kind woman she had met a short time before. The woman advised her to seek the intercession of Padre Pio. She shared some of the facts surrounding Padre Pio’s life with Clarice. Clarice felt skeptical about the woman’s words regarding Padre Pio. However, when the woman told her of some of the graces she had received through the intercession of Padre Pio, Clarice became more interested. “I think you should write a letter to Padre Pio,” the woman said. “In the letter, you can explain all that is troubling you. You can ask Padre Pio to pray for you.” Clarice became convinced that it was a good idea and quickly penned a letter and sent it. Clarice assumed that Padre Pio would soon write back to her. She imagined that it would be a long letter filled with spiritual insights and wise counsel. What she did not know was that all of Padre Pio’s correspondence was handled by his secretaries. One night as Clarice was getting ready for bed, she noticed a very strong scent of roses in her room. She could find no explanation for the beautiful fragrance. She knew that there were no flowers in the house. There were certainly no flowers in her bedroom. She looked under her bed just to make sure that no one had hidden roses there, but just as she had suspected, she found nothing. The next morning, Clarice greeted her uncle, her father, and several other friends who were sitting around the dining table downstairs. Clarice’s uncle, who lived at the house with her and her family, told her that he had a very strange experience the night before. As he was getting ready for bed, his room became filled with the fragrance of sweet-smelling flowers. It was a fresh and delightful fragrance and it lingered in the room for a long time. The fragrance of gardenias, then carnations, and finally violets followed. It happened between 12:30 a.m. and 1:00 a.m. He thought that it might be a premonition of the death of a friend or relative. Clarice told her uncle that she too had the same experience the night before, when the beautiful scent of roses filled her room at about 12:30 a.m. The next time Clarice saw the woman who had shared the story of Padre Pio’s life with her, she told her what she and her uncle had experienced in their home. The woman then explained to Clarice that Padre Pio often let people know that he was interceding for them by allowing them to experience a wonderful fragrance. Clarice had never heard of such a gift. She thought about the letter that she had written to Padre Pio. She had sent it to him just three days before. She was convinced that he had received her letter and was letting her know by the scent of roses that his spirit was with her. Clarice felt a great hope rise up in her heart. She had faith that Padre Pio was going to help her in her difficulties. Clarice wrote a second letter to Padre Pio. She thanked him for the fragrance of roses that she had experienced. She included a donation in the letter. She told him that she had faith in him and that she was waiting for a reply. A few days after she wrote the second letter, she noticed the fragrance of lilies all around her. The wonderful fragrance came suddenly and with great intensity and then vanished just as suddenly as it had come. Clarice decided to write a third letter to Padre Pio. Again she thanked him for the fragrances of roses and lilies. She wrote that she was waiting to hear his words of wisdom and again she enclosed a donation in the letter. After she sent the letter, the delightful perfumes ceased altogether. There were no more tangible signs of Padre Pio’s nearness. Every day, Clarice went to the post office to see if a letter from Padre Pio was waiting for her, but no letter ever came. She often thought about her dream and the hand that lifted her over the barrier of rocks and placed her right at the entrance to Our Lady of Grace church. There was a barrier in her own life, a cross that she carried daily. More than anything else, she wanted to be freed from it. She clung to the hope that Padre Pio would be able to help her. One night, Clarice’s darkened bedroom became illuminated with a soft light, similar to moonlight. As unbelievable as it was, she saw Padre Pio standing at the foot of her bed. He was wearing a brown Capuchin robe. Around his waist was his Capuchin cord and he rested one of his hands on it. He was wearing gloves that only covered part of his hands. There was fear in Clarice’s heart and at the same time there was no fear. Padre Pio said three words to her but she did not understand the meaning of the words. She tried to turn on the light next to her bed, but for some reason the light would not turn on. A second time, Padre Pio repeated the three words, the words that she did not understand. Again she pushed the switch to turn on the light, but it would not turn on. For a third time, Padre Pio said the mysterious words. Then he vanished. The soft glow that reminded her of moonlight vanished right along with him. Clarice touched the light switch and this time it turned on easily. Just as the light came on, she saw her bedroom door swing open as if somebody was leaving the room. Seeing Padre Pio at her bedside was something that Clarice would never have believed possible. She had waited a long time for a letter from him but she had never received one. She was not concerned about that anymore. She had received something much greater than a letter. Padre Pio had come to her in person. Clarice was certain now that Padre Pio was aware of her needs and that he would lead her on the right path. Several months later, Clarice traveled to Rome to visit her good friend, Margherita Hamilton. Clarice shared with Margherita what she had recently learned about Padre Pio. Margherita told Clarice that she ought to consider visiting Padre Pio in San Giovanni Rotondo. After discussing all the particulars, they decided to make the trip together. From Rome, they boarded a train to Foggia and then took a bus to San Giovanni Rotondo. There were two hotels in the little town and neither were in good condition. Clarice and Margherita felt fortunate to find lodging in the cleaner of the two. In order to get to Padre Pio’s early morning Mass, they had to get up in the middle of the night and walk two miles in the darkness. There was not a single light on the road to guide them to the church. During their first full day in San Giovanni Rotondo, Clarice and Margherita met Mary Pyle. 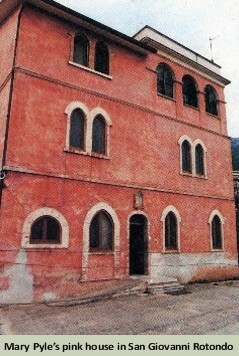 Mary lived in a spacious house that was situated very close to the monastery. Nestled in an almond grove, Mary’s pink house was a haven for countless pilgrims who came to see Padre Pio. Clarice and Margherita felt fortunate to be able to rent two rooms in Mary’s home for the duration of their visit. Mary Pyle was well aware that there was a shortage of accommodations in San Giovanni Rotondo and she did what she could to help the situation. She put three cots in the basement of her home in order to offer hospitality to the pilgrims who needed lodging. To provide for more people, Mary added another story to her house. Although Clarice was very grateful for the hospitality, the room that Mary Pyle offered to her left much to be desired. The room was damp and cold and Clarice could find no way to take the chill off. There was a wood-burning stove in the corner of the room but unfortunately it was broken. The night stand consisted of a piece of wood on top of a stack of bricks. Clarice’s bed was very short and very narrow. The mattress was stuffed with dried leaves and corn husks. It was very uncomfortable to say the least. Nevertheless, she preferred the room she had been given to the room in the basement. One had to admire Mary for her true Franciscan spirit and her detachment from worldly comforts and possessions. Her own bed was even more uncomfortable than the one given to Clarice. It was more like a wooden chest than a bed. No one could understand how Mary was able to sleep on such a hard bed. People often teased her about her bed but she could never be persuaded to exchange it for a more comfortable one. Mary, who was born into a wealthy family in New York City, visited Padre Pio’s monastery for the first time in 1923. She was so impressed by attending his Mass and receiving his priestly blessing that she decided to move to San Giovanni Rotondo permanently. Mary had truly left her wealthy New York City lifestyle far behind her. Mary was in the process of moving to a very small and modest room near the basement of her house when Clarice and Margherita made her acquaintance. The bedroom that Mary had been occupying was large and comfortable and included a sunny balcony. She decided to move to the lower floor of the house in order to offer her warm and pleasant room to the pilgrims. During their visit to San Giovanni Rotondo, Clarice and Margherita were impressed by Mary’s many works of charity. A number of the people in the town were illiterate. They often knocked on Mary’s door, asking her to write letters for them. They would dictate the letters to Mary as she wrote. She was always very glad to be of assistance. Mary, along with some of her companions, baked the hosts that were used for Holy Communion at the monastery and sewed the priestly vestments of the Capuchins. Her workload was always heavy and she hardly had a moment to spare. Padre Pio was very much aware of Mary’s generous heart. He often sent people to her house who had needs of one kind or another, knowing that Mary would help them to the best of her ability. The children in San Giovanni Rotondo loved to visit Mary in her home. She often played games with them and made sure to keep little prizes on hand for such occasions. One favorite game was “Lotto.” Mary always included a Catechism lesson whenever the local children visited her. Due to Mary’s continual and dedicated efforts, the children in the area possessed an impressive understanding of their Catholic faith. When the local children were ready to make their first Holy Communion, Mary purchased suits for the boys and white dresses for the girls if their parents could not afford to do so. Clarice felt very fortunate to be able to spend time with Mary Pyle as well as other devout souls who served Padre Pio’s work. Since the time she had arrived, Clarice had been looking forward to going to confession to Padre Pio. Finally, her opportunity came. When Clarice walked into the confessional and knelt down, she was struck by the fact that Padre Pio’s hand was resting on the cord of his Capuchin habit. She remembered that his hand was in the exact same position when he visited her in bilocation at her home in Chiavari. Clarice was also struck by Padre Pio’s eyes. They seemed to look right inside her soul. There was also a severity in his gaze. In the confessional, Padre Pio told Clarice that he would do all the talking. He then began to name her sins one by one, and each time he did so, she confirmed that what he said was true. He counseled her regarding the burden that she had been carrying in her heart for such a long time. He told her that she was enduring a “true calvary.” “Even if you are not able to feel joy in carrying your cross, at least try to practice resignation and patience,” he said to her. The confession to Padre Pio was over in less than three minutes. Clarice felt a great sense of peace in her heart. There had been no need for her to explain anything to Padre Pio. It was obvious that he was aware of everything in her life. In a few short words, he was able to counsel her and give her new hope. Because it was so chilly in Mary Pyle’s home, Clarice used to walk briskly up and down the road that fronted her house, in an effort to warm up. One day, as Clarice walked past the church of Our Lady of Grace, she looked inside and noticed that several of the local women were cleaning it. She learned that they followed a regular weekly cleaning schedule. Clarice began to join the women in their work and counted it a great privilege. The monastery church of Our Lady of Grace had a Franciscan simplicity and beauty that were uplifting to the spirit. Beautiful statues had been placed in the niches and alcoves. A lovely painting of Our Lady of Grace had a permanent place in the sanctuary. Over the altar railing was an arch on which delicate roses and lilies had been painted. It reminded Clarice of her experience in Chiavari when the beautiful fragrance of roses and lilies filled her room. In the afternoons, the Capuchin priests and brothers would gather in the choir loft of the church for the recitation of their community prayers. At those times, Clarice and the other women who cleaned the church, observed a strict silence, taking care not to disturb the Capuchins in any way. Clarice was able to distinguish Padre Pio’s voice from the others during the time of vocal prayers. He never hurried through his prayers but pronounced each word slowly and with great deliberation. Clarice always noticed a sadness in Padre Pio’s voice as he prayed with his fellow Capuchins. Clarice and Margherita were able to attend Padre Pio’s Mass each morning and they counted it a great and inestimable gift. At the time of Holy Communion, the people in the congregation walked up to the top of the stairs in the sanctuary. 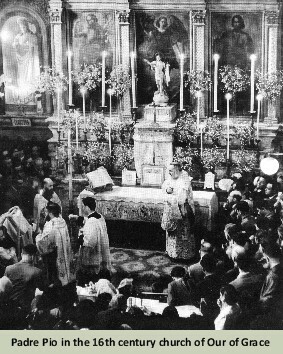 There they knelt before Padre Pio to receive Holy Communion. This saved him from having to walk down to the altar rail to distribute Holy Communion. The painful wounds of the stigmata that pierced his feet, made it very difficult for him to walk. After Padre Pio’s early morning Mass, confessions were heard in the church until 10:00 a.m. When the confessions were over, all activity in the church stopped and did not resume again until the following morning. Each day during their visit, Clarice and Margherita had ample time to explore the town. On occasion, they would walk to the cemetery where Padre Pio’s parents were buried and pray at their graveside. While in San Giovanni Rotondo, Clarice and Margherita made the acquaintance of a kind man named Mario who, along with his wife, owned a restaurant in town. The restaurant had a dirt floor, and oddly enough, there was a well right inside the restaurant. The restaurant looked more like a small cabin than an eating establishment. During the cold weather, the wind would whistle through the cracks in the walls. It was a primitive place, to be sure. Mario’s wife had a great devotion to Padre Pio. On one occasion, when she made her confession to Padre Pio, she told him that she was concerned about her four-year-old son. “I feel worried,” she said to Padre Pio. “I have to work in the restaurant all the time with Mario, and I am not able to give my son the time or the attention that he needs.” Padre Pio told her not to worry. He told her that he would always watch over her son and that he would protect him from harm. The woman left the confessional greatly consoled. The days that Clarice and Margherita spent in San Giovanni Rotondo passed quickly. When it was time for them to return to their homes, they knew they had been truly blessed, far beyond their expectations. They made many subsequent trips to San Giovanni Rotondo through the years. One summer when Clarice was visiting the monastery, she became very ill with a painful intestinal problem. None of the remedies she tried proved to be of any help. She then remembered the blessed water of Padre Pio. 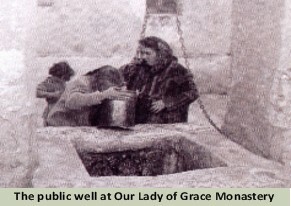 There was a well in the courtyard of the monastery and both the well and the water in it had been blessed by Padre Pio. Many of the residents of the town had great faith in its healing powers and took the water home in bottles. Clarice drank some of the blessed water and was immediately healed of her intestinal problem. Clarice often invited her friends and relatives to join her on her trips to San Giovanni Rotondo. She began organizing pilgrimages as well. She was instrumental in starting a number of Padre Pio prayer groups in her area and she remained dedicated to promoting Padre Pio for the rest of her life. “Try to remain under God’s gaze and God will always bear you witness,” Padre Pio said to her on one occasion. When Clarice was diagnosed with an incurable illness, her faith remained strong. She hoped that she would recover but she was completely resigned to the will of God. She said that Divine Providence had always arranged the events in her life for her good. “If it happens that I should die soon, I know that this would be the best possible thing for me,” she said to her dear friend Margherita Hamilton. Clarice Bruno died peacefully on August 5, 1970. I urge you to unite with me and draw near to Jesus with me, to receive his embrace and a kiss that sanctifies and saves us . . . Let us not cease then, to kiss this divine Son in this way, for if these are the kisses we give him now, he himself will come to take us in his arms and give us the kiss of peace in the last sacraments at the hour of death.